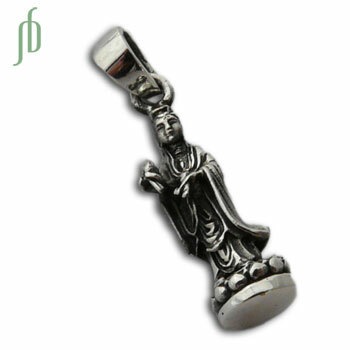 Guanyin is a female bodhisattva, or enlightened being. She is a buddhist goddess of mercy. This Quan Yin pendant is a beautiful mini statue that can be worn on your own necklace or with one of ours.. 2.5 cm. 4.5 g.
1 mm soft Silver Snake Chains are perfect accompaniments to any of our pendants.